See a doll, hear a doll. Touch it. Buy it. Then come back for more. The sensory approach to doll selling that Jerree Childers has chosen for her store in Kingsport, Tenn., seems to be working; she estimates that 70% of her customers are repeat buyers. From the 12? by 14? Lee Middleton Original Dolls Newborn Nursery display visible from the mall lobby outside her store to the 27 baby sounds she plays on a special CD, to the 24 Ashton-Drake Collectibles that customers can pick up and cuddle, Dolls by Jerree is a total-immersion doll experience. ?People will walk in and bring friends back just to listen to the baby sounds and show them the babies,? Childers told TDmonthly Magazine. She, her daughter Neysa Lamon and granddaughter ? the store?s full-time staff ? usually dress in white doctor?s coats or pastel nurses? scrubs to maintain the illusion of an actual nursery. 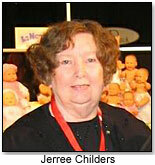 Childers, who?s been selling dolls for 12 years, moved her store from a downtown area to the mall four years ago. She appreciates the 24-hour security of her ?new? location ? and the increased foot traffic. ?After I opened the store here, people would come in and tell me that they?d always meant to stop at my other store, but were just too busy,? she said. Now she has approximately 60 walk-ins on an average day, sometimes getting 10 customers at a time. Childers always encourages little girls to bring their ?babies? back for a visit, and many do. She even baby-sits while ?mommy? goes shopping for a new brother or sister. To satisfy demand for more hands-on experiences, she redesigned her 1,800 square foot space to fit a table where customers can craft their own Apple Valley Dolls. In addition, Neysa will sculpt one-of-a kind dolls in back of the store. Events such as a Lee Middleton doll-making and signing with Reva Shick on October 13 and a live Santa to audit little girls? Christmas wishes keep customer interest high. She?s also winnowing down her selection to leave plenty of room for her top-selling dolls, plush and porcelain. Lee Middleton, Ashton-Drake, Dolls by Berenguer, Adora and Madame Alexander (see: "Real Babies" and "Top 10 Realistic Play Babies") are some of her best sellers, as are limited-edition collectible porcelain and vinyls by Linda Rick, Fayzah Spanos, Show Stoppers and Seymour Mann. Childers? own passion for dolls helps her choose the ones her clients will fall for. ?We go to the Toy Fair every year to look at the dolls in person,? she said. ?The photographs are good, but they?re deceiving because the dolls look much more beautiful in real life.? Whether customers seek a $500 collectible or a $10 bargain, she strives to satisfy them all. ?One of my repeat customers told me she that she comes to my store instead of some of the bigger stores because of the special treatment she gets here,? said Childers. The fact that doll lovers travel from all parts of the country just to buy at Jerree?s is proof that if you build a creative shopping environment, the customers will come.